Specificity Region between residue 818 and 868 of human Apoptosis-Linked Gene 2-Interacting Protein X using the numbering given in entry NP_037506.2 (GeneID 10015). 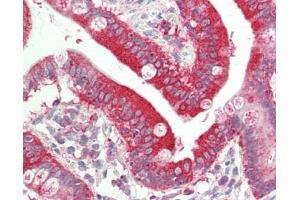 Usage: Immunohistochemistry: Antigen retrieval with Tris-EDTA  pH 9.0 is recommended for FFPE tissue sections. Human controls: Breast Carcinoma, Ovarian Carcinoma. Buffer Tris-buffered saline, 0.1 % BSA, 0.09 % sodium azide. Storage Comment Store at 2-8°C for up to 1 year.